Republicans held onto their majority in the Iowa House, but close races with possible recounts and a looming special election in December cast doubt over which party will hold control of the Iowa Senate in January. House Speaker Kraig Paulsen, a Republican from Hiawatha, is likely to win reelection as House speaker in 2013. A Republican senator seeking reelection died in October and a special election is scheduled for December 11 to fill that seat. Senate Democratic Leader Mike Gronstal of Council Bluffs had been targeted by Republicans for defeat in 2012, but Gronstal survived a challenge from an aggressive and well-financed opponent. 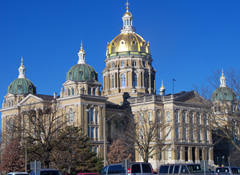 Democrats had held a 26-24 advantage in the Iowa Senate and Republicans were hoping to win party control of the Senate in 2012. It’s likely there will be a recount in at least one state senate race and two others were too close to call as of midnight.